Mrs. Gillian Smith (ably aided and abetted by Mr. Hubert Smith!) 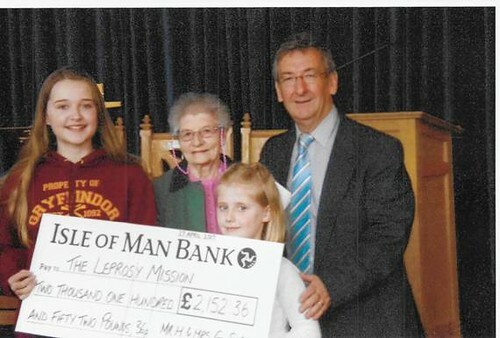 works very hard to raise funds for the Leprosy Mission all year around, through sales of her homemade jam, marmalade, poetry, running raffles, and organising charity events. Gillian also sends orders to The Leprosy Mission's shopping catalogue, and donates her commission back as part of our total gift - this was £84.24 this year. Also as part of St Andrew's Mission we collect donations for the Foodbank, and for Graih , locally, and goods to help support a charity in Uganda, including school clothes (children cannot attend school without uniform, but some families cannot afford it), baby clothes and blankets made by the Knit and Natter Group, and bras (needed and valued by women both young and old. Our Knit and Natter Group have also made many hats, scarves, mitts and other and warm woollies to go with our shoe boxes to Belarus.